As the days become longer and the weather gets warmer, it’s time to start thinking about sprucing up your entryway. Decorating your entryway for Spring is a great way to freshen up your home and your entryway is like a preview of the rest of your home; it is the first place that guests get a taste of your style. 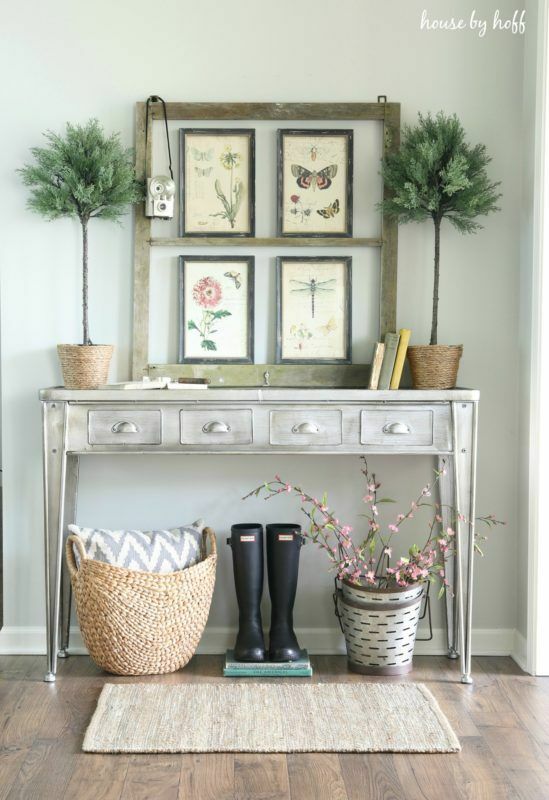 Consider these easy to add entryway ideas for your home. Grand entryways will be a large area rug. Use a round shaped rug paired with a spiral staircase. 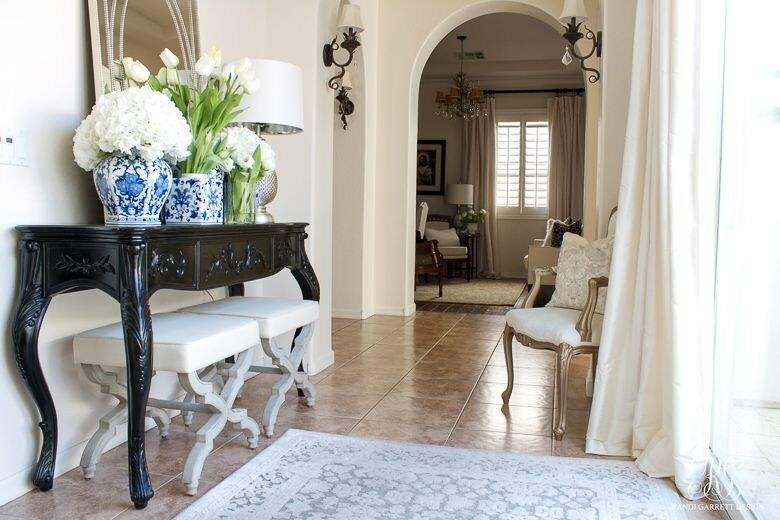 Use a round accent rug underneath a round table in the center. Tradition rugs like oriental or Persian are go-to shapes, but you can think outside the box if you want with a geometric pattern. Standard entryways are smaller than a grand entryway but bigger than a mudroom. Welcome guests with a brightly patterned runner. A runner will create a cozy feel while serving as a place to catch dirt, pollen, and other allergens from entering the rest of your home. 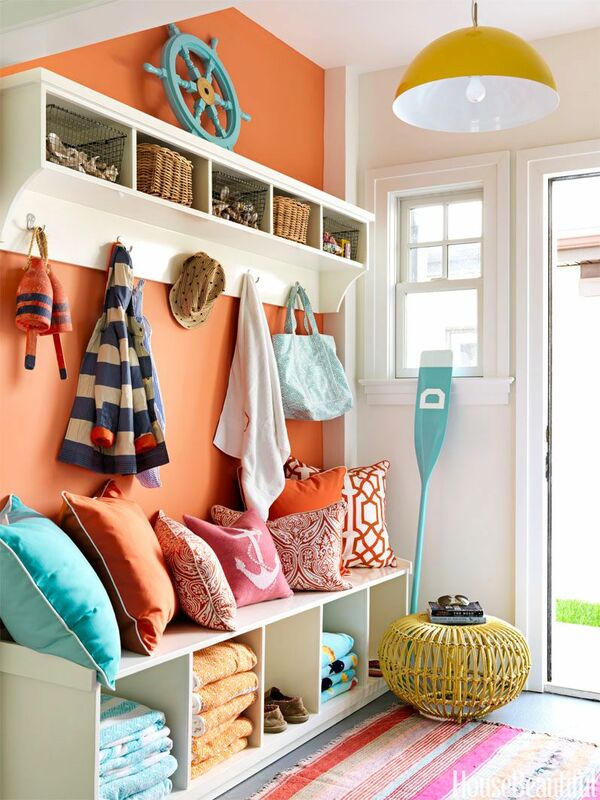 Small entryways also are known as mudrooms, can be one of the hardest working places in the home. Combining the size of the space and the number of multiple functions can be a design challenge. 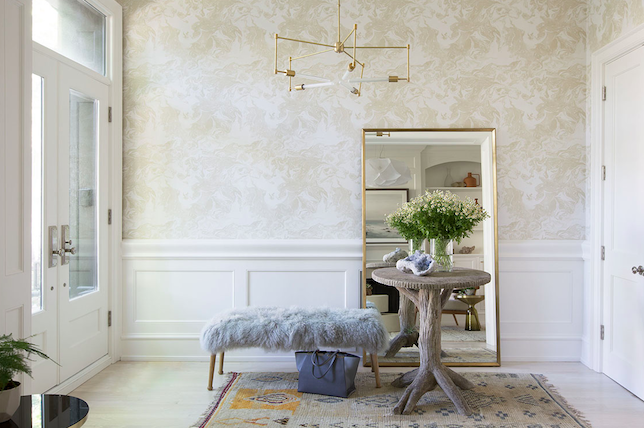 By adding a round shaped mirror, you make the entryway look more prominent, and the shape will remind guests of the sun which goes with the overall theme of Spring. Storage benches serve as a place to sit down and take your shoes off after a long day. They also serve as a place to store those shoes so you can easily find them the next day. 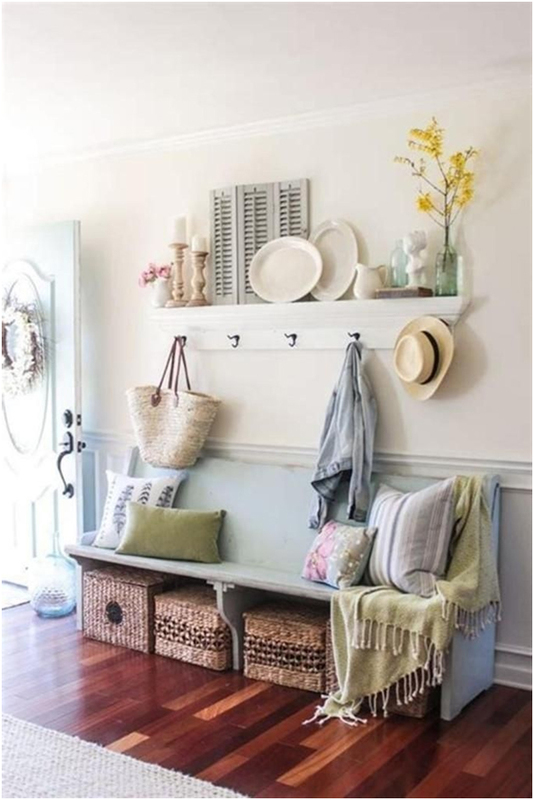 By adding a storage bench to your entryway, you are maximizing your space while keeping it beautiful and functional. Choose colorful storage baskets to add a little pizazz to your storage bench. Spring is the perfect time to bring in the beautiful pastel colors of the season to your entryway. Florals patterns or garden leaf prints with pastel hues are refreshing. Spend time adding in new accessories that represent the new Spring season to come. White is a classic and beautiful color. Using oriental vases to display white tulips in contrast to the dark wood console table creates balance. This entryway is centered with a painted wooden church pew. It’s the perfect size for this entryway and baskets fit underneath for storing shoes, dog leashes and extra blankets. Using two types of white -white walls with a white coat rack shelf and white decorative plates makes this entryway look clean and cozy. A few yellow stems branches add the pop of color this space needed. 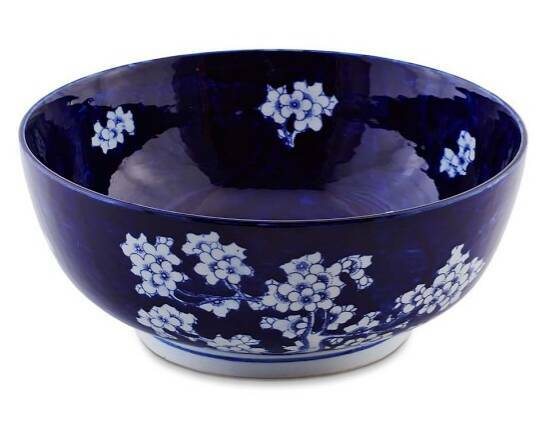 Update your catch-all bowl with something more seasonal like this Chinoiserie Ceramic Bowl from Williams-Sonoma. 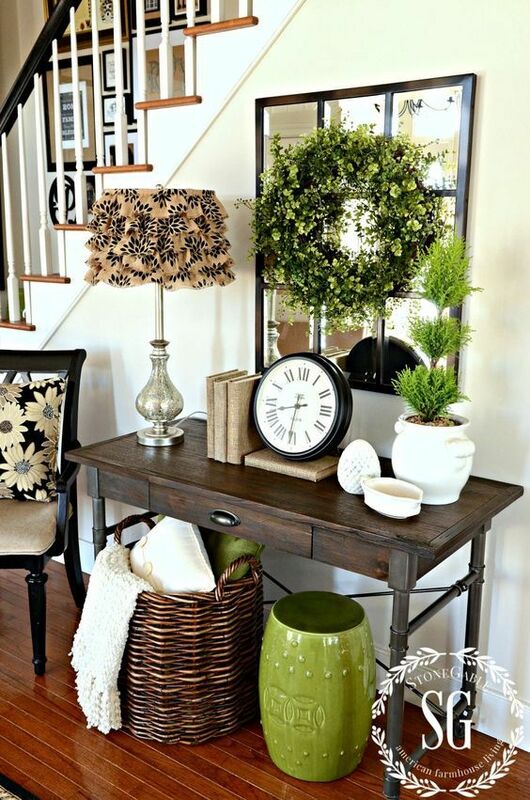 Dress up your console table for Spring by bringing beautiful elements of greenery to add to your console table. A major trend right now is decorating a square mirror with a vibrant boxwood wreath. Plant more greenery in a white vase and trinket dish for a place to drop your keys. Even when the snow is gone, a place to hang your coat will still be needed. After all, Spring showers are on their way. Decorate your entryway with spring plants that will benefit from the indirect sunlight but can’t go out just yet. A nice set of contrasting pillows and throw help fill in the entryway to make it almost a cozy nook. Wall art that matches the season is a great way to brighten up day and refresh your home. This beautiful pastel piece featured in Elle Decor is paired perfectly with the white coral and yellow forsythia stems. A themed entryway is always a good idea. Choose a Spring theme that will be cheerful and delight your guests. 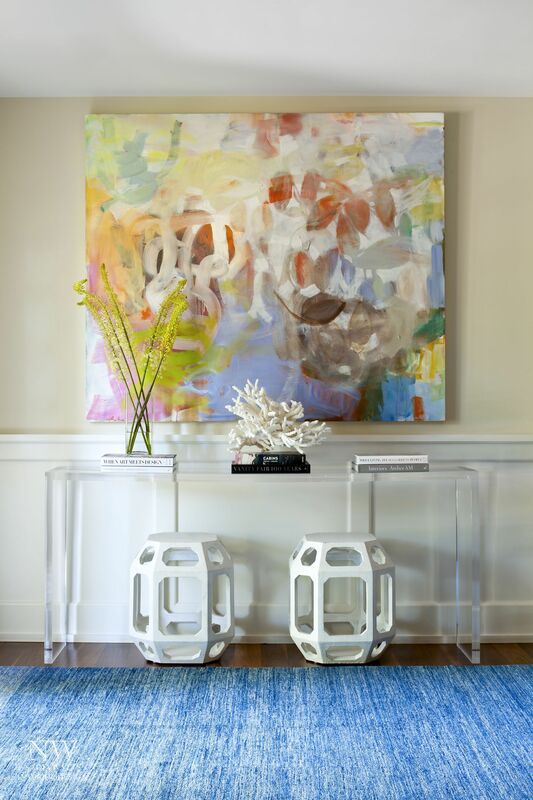 This Japanese inspired entryway featured on One Kings Lane is the perfect Spring theme. 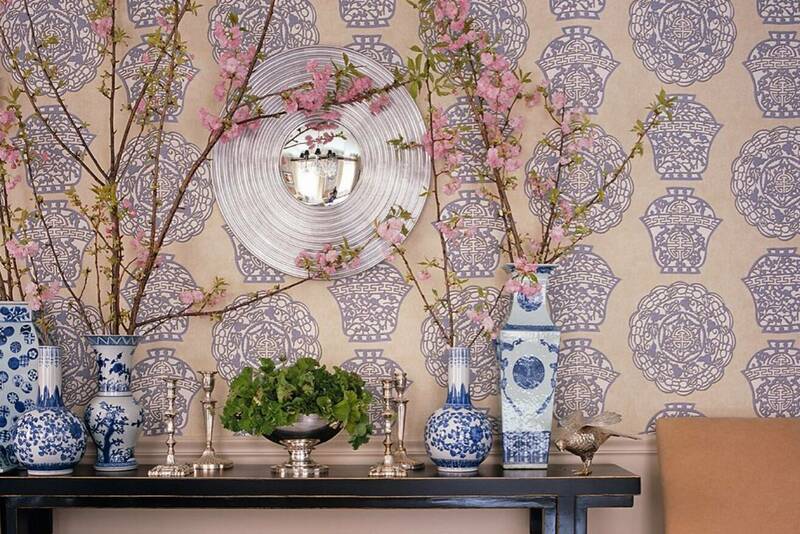 The beautiful oriental wallpaper compliments the exquisite ornamental vases that are holding pink cherry blossom stems. Gardening is always a great spring theme. 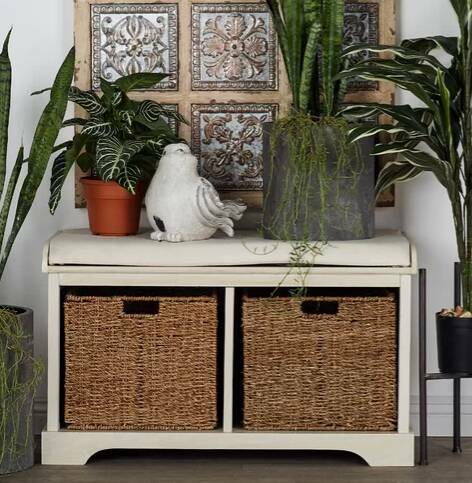 Decorate a neutral console table with matching greenery and framed garden plants and insects prints. Cherry blossom stems give this neutral space a pop of color. 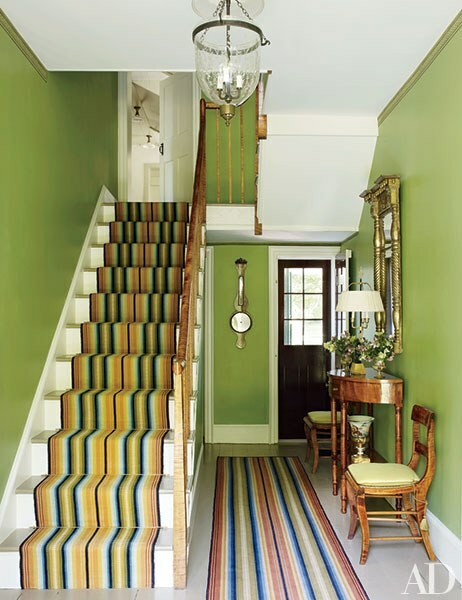 Now is the time to transition your entryway from Winter to Spring. Springtime is a cheerful time of year with lots of new life. 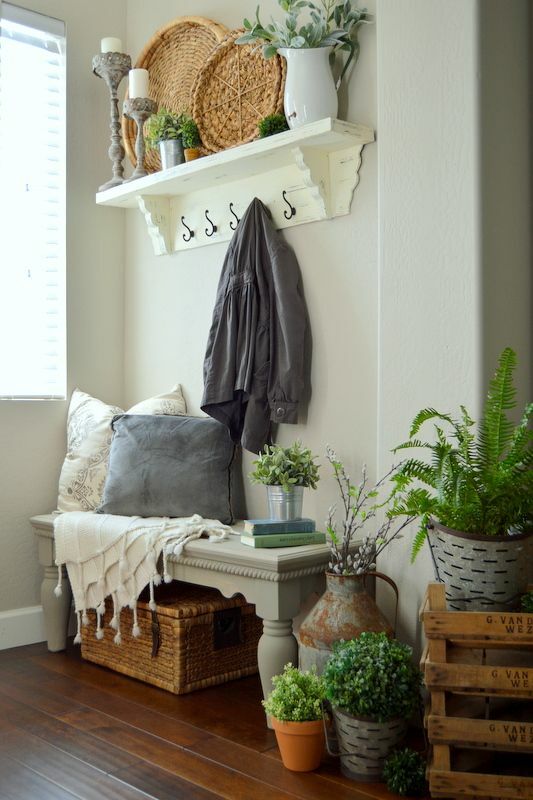 We hope these entryway ideas will inspire you to freshen up your entryway decor, bringing a smile to your guest’s faces. Happy Spring!